It’s time for the annual 2 in Showcase Halloween Movie Marathon! 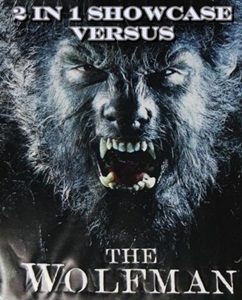 This year, the guys sit down and do battle with five films from the Universal Pictures Wolfman franchise: The Wolfman (1941), Frankenstein Meets the Wolfman (1943), Werewolf of London (1935), She-Wolf of London (1946) and the 2010 remake of The Wolfman. Our favorites? Our least favorites? We tackle ’em all! And for a more snarky, play-by-play commentary on the five films, check out our rundown blog post at Evertime Realms. In the picks, Blake sticks with the monster theme for Victorian Undead Special: Sherlock Holmes Vs. Dr. Jekyll & Mr. Hyde, and Kenny goes with a DVD pick, the new Predators film. Contact us with comments, suggestions, or anything else at Showcase@CXPulp.com! This entry was posted in Showcase Podcast and tagged Dr. Jekyll and Mr. Hyde, Frankenstein, Halloween, Predator, Predators, She-Wolf of London, Sherlock Holmes, Victorian Undead, Werewolf of London, Wolfman. Bookmark the permalink.